Manhyia Palace, on Monday, March 18, 2019, officially launched the 20th anniversary celebrations of the enstoolment of the Asantehene, Otumfuo Osei Tutu II on the Golden Stool at the palace in Kumasi. 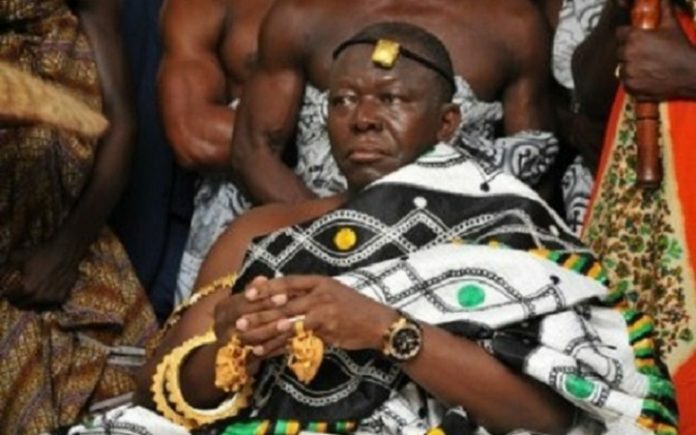 The Chief linguist of Asantehene, Nana Nsuase Poku Agyemang III, who launched the programme at the Manhyia Palace in Kumasi, said it officially started on March 9 and ends on May 22, 2019, and the climax fixed for April 21, with a grand durbar at the forecourt of Manhyia Palace. Launching the programme during the first meeting of Asanteman Traditional Council, the Chief linguist also outline some of activities including performance of Nsuman Agro by Otumfuo on Monday, April 1, and Asanteman Queen Mothers’ Day on Wednesday, April 10. Others are video/photo exhibition on twenty (20) Years of Otumfuo’s reign on Monday, April 15, and unveiling of Otumfuo’s statue at the newly constructed Kejetia Redevelopment Project and the sod cutting for Central Market Redevelopment Project – Phase Two on Thursday, May 2. Otumfuo Osei Tutu II was educated at the Sefwi Wiawso Secondary School and Osei Kyeretwie Secondary School (OKESS) in Kumasi and continued to study Accounting at the Institute of Professional Studies (IPS), now University of Professional Studies, Accra in 1971, before proceeding to the United Kingdom to enrol at the Kilburn Polytechnic in North-West London to pursue Accounting studies. Two years later, he changed his programme of study and enrolled at the University of North London to read Human Resource Development and Public Administration. He worked variously as a senior consultant with the Ontario Mutual Insurance Group in Toronto, Canada, and as an accounts officer at Oxo, a British food manufacturing firm. He also joined the Manpower Services Commission attached to the Brent Council in North London, where he helped to develop and oversee projects to assist unemployed youth from deprived communities to get into viable employment. Otumfuo Osei Tutu II returned to Ghana in 1989 to set up his own business. He, at the same time, acted as a representative of some reputable British and European companies in the mining sector.